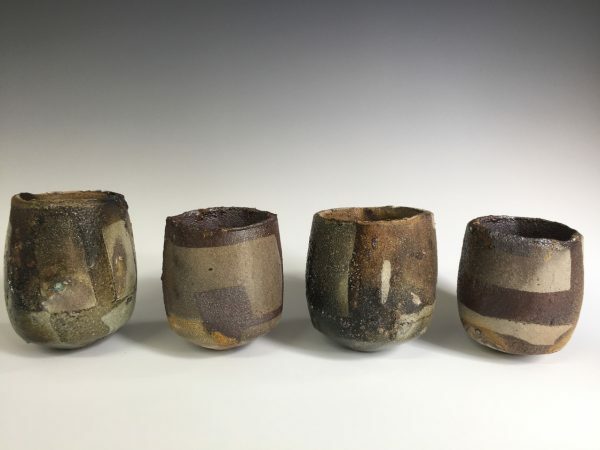 I hand build a range of vessels using stoneware clays. I use a method of inlay with contrasting clays to make loose geometric designs into clay slabs. I then cut up these slabs to create a disruption to the pattern before using them to build with. My work is vapour and ash glazed as a result of the eccentric saggar firing in the gas kiln. I fire my pots packed in locally gathered seaweed and seashells and let the kiln do it’s work. I aim for a balance of contemporary form with timeless surface.